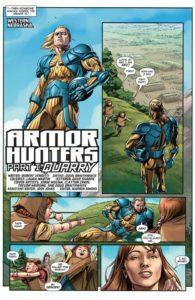 Armor Hunters is meant to be a culmination of story told over the course of 7 other volumes in the publication history of the new X-O Manowar series. 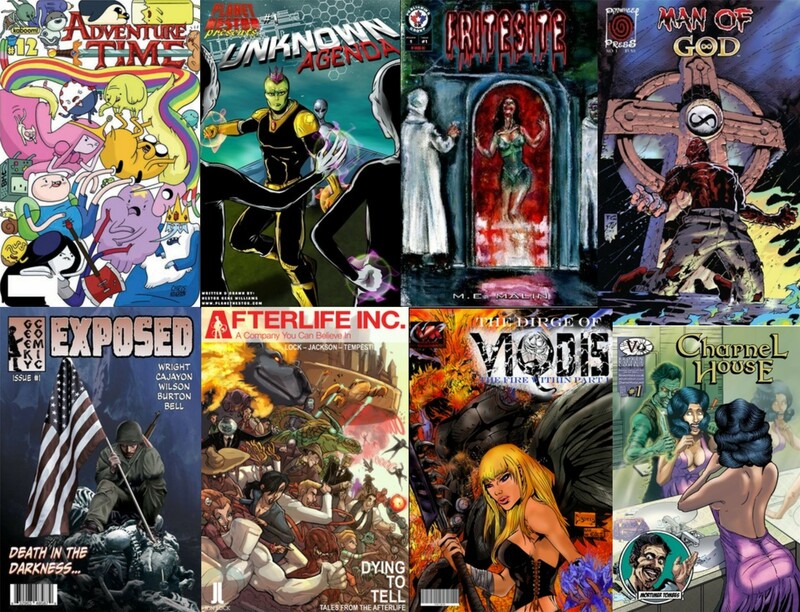 Revitalized along with the rest of the Valiant Universe several years ago to create an updated, wholly new universe of comics for their characters to play in. And since then Valiant has been doing a pretty decent job at slowly updating their characters in which they have a lot. However as much as I did in fact enjoy this event it did make me wonder if it should have been its own comic or if it would have fit better as simply just another story arc in the main Manowar title. 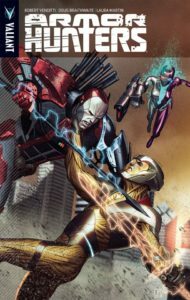 Because while this comic does guest star some other Valiant characters that you can then follow their adventures in this fight in their own titles, the main crux of the story is centered almost solely on Aric and Livewire, both of whom could not only have taken center stage in Aric’s own comic together; but Aric gets a full story arc here complete with the usual “I’m going to give up being a hero only to be drug back into the fight” cliché. I’m not really sure what would have been worth exploring in the actual X-O Manowar tie-in arc to this. Other than what could have been better served as an aftermath arc. While the decision to make this its own thing can of course continue to be debated overall I really do believe this is a solid story. There are some hiccups here and there, little things I think could have been done differently or at least explored differently. The aforementioned giving up the title cliché, as well as the final battle with the actual main Armor Hunter feels a bit lackluster. 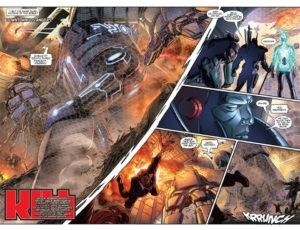 Most of the fight is watching a giant robot destroy a city – which is hella awesome – but seeing Aric, Ninjak, Bloodshot and Gilad the Eternal Warrior going up against these Armor Hunters should have been a lot more fun. Speaking on behalf of the Armor Hunters however I have to say I really enjoyed these villains. Venditti does a pretty good job at giving them some spotlight and making some of them feel like real people doing a job that they don’t necessarily enjoy but its what they’ve been ordered to do no matter the cost. And really the sheer devastation these four hunters, their alien hounds, and their giant robot spaceship deal to the world is unimaginable. But incredibly impressive because of how ballsy these moves are for any universe to pull off. Being as how this story is two years old as I write this I wonder if the changes made to this world here are still in effect or if things have been quietly swept under the rug and either forgotten or fixed. I have no idea if Valiant would do that but I’m still curious. Aric himself is great character who I felt myself sympathizing with him regardless of having read – sadly – very little of his comics. Both new and old. However this event did make me want to read more for sure because I’m definitely invested in his character now. Though he goes through the struggle with the gauntlet crisis so many stories tackle never once does Aric not feel like he’s doing something simply because the story demands it. He is powerful, and he knows that, but he’s not fully aware of whether or not he can kill these hunters simply by flying into space and punching a hole in their robot ship. Later we find out no, he’s not exactly stronger than them and he has to put up a fight in order to bring them down so the story ends up justifying itself for some of Aric’s passiveness through most of the comic. And like the Hunters the side characters in this series get their moments to shine as well. Bloodshot, Ninjak, Gilad all whom I already mentioned above. I really enjoyed Ninjak, I feel like he needs to have a french accent that’s just currently how I imagine him. I want to know more about the history between Gilad and Aric who seem to know one another from Aric’s previous life. And Bloodshot is just like Punisher and I’m a-okay with that, although Valiant has to be aware of his similar color scheme to the other Valiant character Rai. I just find their similar color schemes funny and I’m not sure why. 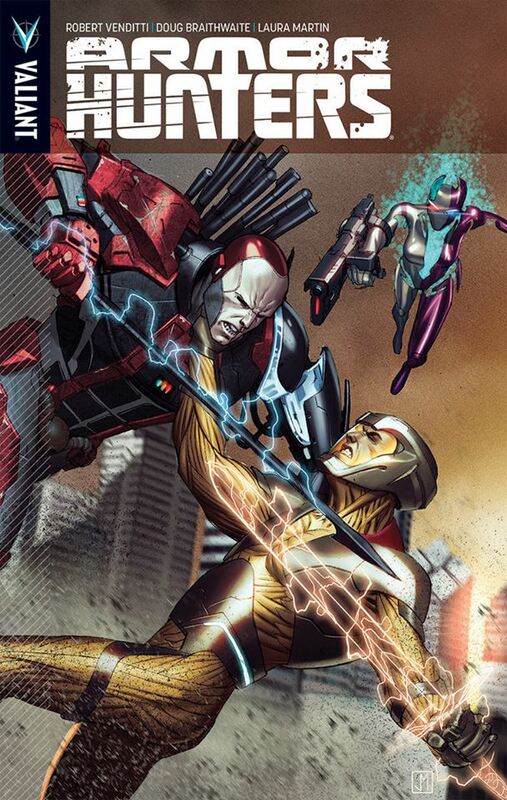 Reading this I felt the breakout was Livewire, again another character I already mentioned. In a weird way she sort of became the main character for awhile defending the Earth the best she could while Aric was in his denial stage. This is a character I had no idea existed before reading this comic but she is awesome. Venditti, again spotlighting his knack for using characters to great effect, really gives her humanistic traits of doubt and perseverance that allow her to be relatable and easy to root for. Of course I’m talking like she isn’t a human, she totally is, but it’s always nice when even reading them for the first time you can tell a character is being used well by how you respond to them. As a story I don’t know if this needed its own mini-series event. As a story though it was well-written, well-paced in most areas, all of the characters were likeable all the way to the villains, and the scope was pretty grand for such a small group of characters as well. It reads like an event that other publishers would feel the need to pull in literally everyone from their universe to tell it but wisely the cast is pulled back and we’re only shown who’s relevant. That to me is a narrative win. And before we’re done here I must talk about the art which is pretty great. Even when changing over from J.G. Jones in the first issue to Doug Brathewaite for the final 3 as well as colorists there never seems to be a real dip in art quality or even in style as the full story blends together quite nicely under different pens. Obviously the one that feels most out of place in terms of its look is Aftermath which like the others before it is still a gorgeous book to look at. There was a lot of cool moments in this series and they were deftly executed by these powerhouse talents. All in all I really enjoyed Armor Hunters for all the things it did right and the few things it did wrong. I’m glad I’m finally getting to really dive into the new Valiant Universe. I’ve been wanting to for a long time and if the strong writing of these latest Valiant books I’ve reviewed is any indication to quality expected elsewhere, here in the Valiant-verse am I here to stay. Summary: Aric of Dacia is the last of the Visigoths after being abducted sixteen hundred years ago. 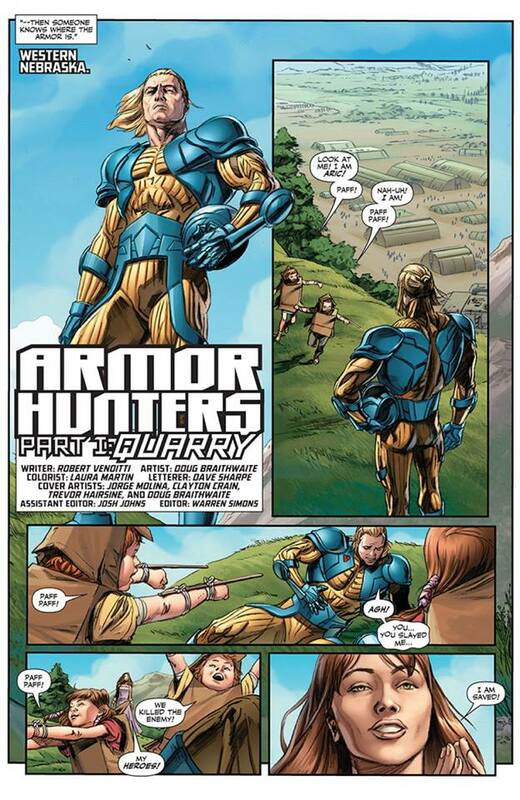 After becoming the host of the sentient X-O Manowar armor he found his way home to Earth to find that things have drastically changed, now he defends mankind from those who would do harm. This story is what happens when those seeking to eradicate the armor from the universe come to Earth and lay waste in the name of justice.